Tough Talk As Oklahoma's Wind Industry Becomes A Political Target Though the wind industry was once a political darling in the state, some say Oklahoma can no longer afford the tax breaks that helped it thrive. 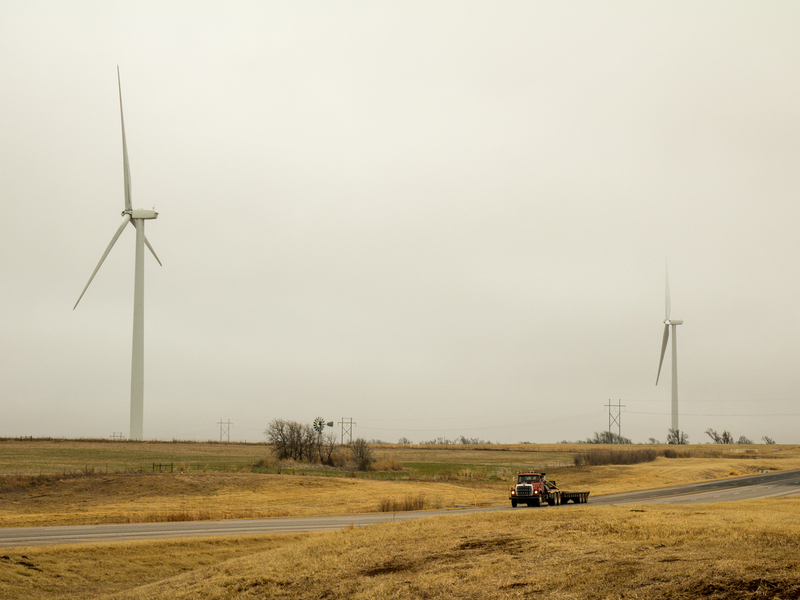 Revenue from wind farms has helped Dewey County, Okla., pay for local schools and a new courthouse. Here's how contentious the wind industry has become in Oklahoma: When a state representative discovered a GPS tracker on his pickup truck late last year, he immediately suspected the industry, in an allegation straight out of a political thriller. 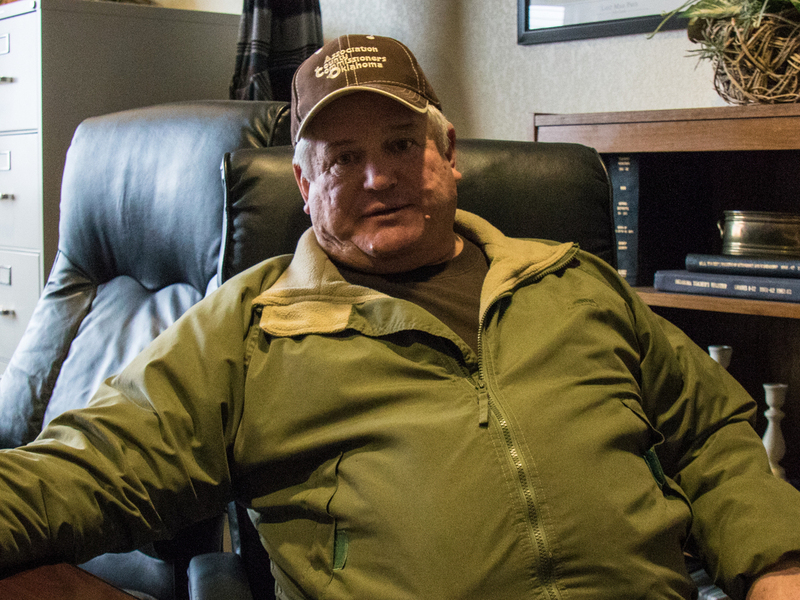 Dewey County Commissioner Junior Salisbury has spoken out against proposals to end incentives for the wind industry. "I pissed off a huge corporation," Rep. Mark McBride told a police officer, according to audio from a police body camera obtained by StateImpact Oklahoma. "You know anything about wind farms?" McBride explained he may have been targeted because he was writing legislation to increase taxes on the wind industry. The case is under investigation. The wind industry denies any wrongdoing. Such tensions are a major turnaround. Starting in the early '90s, this longtime oil and gas state embraced the wind industry, wooing companies with generous tax breaks. Oklahoma recently became second in the country for wind power capacity, after Texas. The nation's largest wind farm is under construction here. But the cost of wind incentives has ballooned as the industry has grown. Lawmakers started missing that lost money, as oil prices crashed and state budget gaps widened. Now, some say Oklahoma can no longer afford the tax breaks that helped wind power take hold. On the local News9 TV show Hot Seat, McBride said budget cuts were already hurting public workers and forcing teachers to quit, and he put some blame on wind companies. "In my opinion, it's time that this industry stepped up," he said. "Quit worrying about their Wall Street investors ... and put something back into the state instead of continuing to take away from it." Battle lines have been drawn in dueling TV ads. In one, paid for by a coalition that includes oil and gas interests, former Oklahoma Gov. Frank Keating laments, "I signed a bill that was supposed to jump-start the wind industry, help the state and create jobs. It didn't happen." Another ad, paid for by the Wind Coalition, counters, "Big oil doesn't want to pay their fair share, and wants to run wind out of the state." For many landowners and local governments, revenue from the wind industry has proved essential. "I'm pretty proud of our little courthouse here," says Dewey County Commissioner Junior Salisbury, showing off spacious rooms and shiny wood trim. The new courthouse was built with a three-quarter-of-a-cent sales tax increase that also upgraded the jail and renovated the fairgrounds. Officials figured it would take 25 years to pay off, and at first, Salisbury says, the county was barely meeting its payments. "Then we got a wind farm," he says, "and our oil and gas picked up, and in under four-and-a-half-years it was paid for." Salisbury says wind farms also generate substantial revenue for local schools. But he's grown increasingly frustrated with lawmakers over the years as they've steadily ended incentives for the wind industry. He's mad at some who want to pull back tax credits already promised to wind companies. He spoke out against a tax on wind-produced electricity that was proposed by Gov. Mary Fallin and groups backed by the state's influential oil industry. "I promise you," Salisbury says, "I'm going to get in there and fight harder and harder to swing this back our way. A state revenue package that included a wind production tax was defeated last month, but still has support in many political circles. The massive Wind Catcher project in Oklahoma's Panhandle is being built without any state tax credits or incentives, says Stan Whiteford with Public Service Company of Oklahoma, the wind farm's co-developer. But the tough talk and proposed rollbacks are causing some other companies to reconsider. "Landowners were incredibly disappointed," says Sean Logsdon of E.ON Climate and Renewables. The company has signed more than 100 lease agreements for a new wind farm, and invested millions laying the groundwork for the project. But "we do have limited capital, and we just couldn't take the risk in Oklahoma," Logsdon says. The company canceled that project and instead invested in a $400 million wind farm that just started operating in south Texas.